Elbow Male Connector with 1/4" NPTF Thread and Quick Connect End for 1/4" tube. 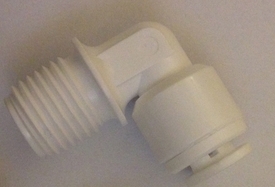 This Quick Connect fitting is manufactured by DMfit. These fittings can be used for inline filters with 1/4" tubing applications. You need two fittings for each inline filter.